In a landmark decision, the Supreme Court ruled that the government may not ban political spending by certain groups. Washington (CNN) -- Campaign 2010 is in full swing: Massachusetts elected its new U.S. senator this week, and the first congressional primaries are just days away. Now the first task for every federal candidate in this midterm election year will be to read the Supreme Court's ruling Thursday on campaign finance for a reality-check road map to their political future. The 183-page decision promises to completely change the way independent spending on elections is conducted. In Citizens v. Federal Election Commission, the justices in a large sense have erased the subtle but important distinction between corporate donors, which are subject to regulation, and individual donors, who largely are not. "It's about money," said Lawrence Noble, former general counsel of the Federal Election Commission and a national expert on campaign spending. "It's about free speech and it's about the ability of corporations to influence elections through the use of their treasury money." The FEC will now be tasked with taking this high court opinion and crafting new rules to ease limits on corporate spending. The big winners will be businesses, unions and advocacy groups seeking to influence the elections, mainly through what are called "issue ads." Other beneficiaries will be television networks like CNN and radio stations that regularly air these campaign commercials. The potential to upset a long-standing, if shaky balance over regulating political speech created a frenzy of cockeyed alliances among groups normally at odds, and spawned nearly four dozen legal briefs in connection with the case the court ruled on Thursday. It being a case about politics, it was no surprise mini-campaigns were launched on both sides. Competing reaction to the ruling from groups and individuals suggest a sea change in the business of federal elections. "It's the Super Bowl of bad decisions," said Common Cause President Bob Edgar, himself a former Pennsylvania congressman. "For too long, some in this country have been deprived of full participation in the political process," said Sen. Minority Leader Mitch McConnell. "By previously denying this right, the government was picking winners and losers. Our democracy depends upon free speech, not just for some but for all." Other interested parties include wealthy, politically active donors -- such as liberal financier George Soros and moderate businessman and New York Mayor Michael Bloomberg, who have spent vast sums of their own money to back political causes or fund their own campaigns for office. The case stems a documentary on Hillary Clinton. Produced last year by the conservative Citizens United, "Hillary: The Movie" was a scorching attack on her. At the time of the 90-minute movie's premiere, Clinton was locked in a tough primary fight with Barack Obama for the Democratic presidential nomination, but her candidacy failed before the feature was widely shown, or had any real impact on the race. A federal court blocked Citizens United from airing ads, as well as airing the documentary on cable television's video-on-demand. The film later appeared in several theaters, and was released on DVD and the Internet -- outlets that are not subject to federal regulation. The Supreme Court initially heard the case in March 2008, looking at the conflict between, on one hand, Congress' expressed desire to control the power of well-financed private groups to spread their political messages and, on the other, concerns over the First Amendment's guarantee of free speech. The court apparently could not reach a conclusion on whether independent groups are subject to the same federal oversight as political committees. "I've seen this movie," Justice Stephen Breyer wryly noted at the time. "It's not a musical comedy." 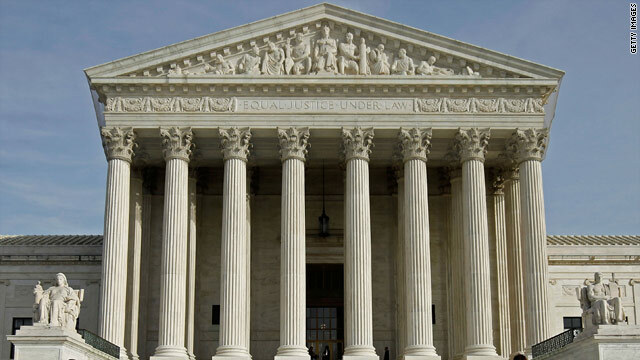 Re-arguments were ordered, and the scope of the case was expanded significantly, into whether important precedents banning direct corporate spending in campaigns should be re-examined. One of those precedents was in 1990, when the high court supported state laws preventing corporations from using what the majority called "the corrosive and distorting effects of immense aggregations of wealth" to support candidates, largely through their own advocacy ads. The ruling required the money to come only from a group's closely regulated political action committee, not directly from what are called "general treasury" funds. The idea was to ensure corporate money was not spent on election-related issues that union members, shareholders, or employees might oppose. PACs are funded only through individual donations. And in 2003, the justices upheld the landmark Bipartisan Campaign Finance Reform Act of 2002, widely known as the McCain-Feingold law, which took effect the day after the November 2002 elections. Among its many provisions were a ban on "soft money," the unlimited and unregulated contributions to national political parties; a ban in the 60 days before an election on advocacy ads -- those criticizing or supporting a candidate's stand on an issue; and contribution limits and donor disclosure requirements. iReporter: Decision "ends real democracy"
Supporters of the law say it was designed to prevent corruption in politics. Opponents said it would criminalize free speech and association. Since its enactment, the high court has written 22 opinions trying to interpret the law. The Citizens United case was the first in recent years to confront the free speech argument head on. In its most narrow scenario, the five-member conservative majority handed the "Hillary" moviemakers a partial defeat, saying they are subject to donor disclosure requirements. But that was only a subplot in a far broader free-speech opinion that will benefit other outside groups with a political message they are itching to promote. "Today's decision is a minor revolution in campaign finance law," said Thomas Goldstein, founder of ScotusBlog and a prominent appellate attorney. "The court's decision overturns the previously settled distinction between corporate and individual expenditures in American elections. It presumably applies equally to state and local elections, given that the court [now] recognizes a First Amendment right." The "Hillary" movie case could launch a range of as-yet-unanswered questions about political speech and government regulation. Because the filmmakers argued their work was information, not political advocacy, should the government place itself as the ultimate arbiter of what is "news"? Some media groups say no. " 'Hillary: The Movie' does not differ, in any relevant respect, from the critiques of presidential candidates produced throughout the entirety of American history," said the Reporters Committee for Freedom of the Press, in a brief to the high court. And can distinctions be drawn over regulating 30-second or one-minute "attack ads," and a 90-minute documentary that could be viewed as an ideological "informercial"? Those distinctions could be future fodder for the courts. At is core, McCain-Feingold clearly will continue to have an impact on every candidate, and everyone that raises or spends campaign dollars. But the law's full power has been blunted significantly. Now the high court has mediated that tricky line, favoring the right of expression of corporations and individuals over congressional efforts to protect against electoral corruption. Coming soon to a television near you: campaign ads, ads, ads.